Animal-assisted therapy (AAT) — the planned inclusion of an animal in a patient’s treatment plan — and Animal-assisted activities (AAA) — the use of animals in recreational and visitation programs to help people with special needs – include a wide range of interventions. They may be animals and people visiting hospitals and long-term health care facilities, specific animal-themed exercises in physical rehab and occupational therapy, equine-assisted psychotherapy, “cell dog” programs in prisons, literacy programs in libraries, “wounded warrior” therapy for veterans with ADHD – and much, much more. Whatever the intervention – which is limited only by our creativity – AAT/AAA are based on an age-old concept. Pets are a friendly, non-threatening common denominator in most American homes. Most children have experienced positive emotional connections with animals while growing up. Pets’ non-judgmental affection-on-demand can bring a sense of serenity and self-confidence that reduces anxiety and stress, stimulates social interaction and conversation, gives us opportunities for nurturing, exercise and play, and distracts us from the cares of our fast-paced world. They amuse and entertain us, make us feel needed, and ask for little in return except to be loved, respected and cared for. In an age where traditional extended families are disappearing, 99% of pet owners consider pets their closest companions and family members. Why should this be? Many people have fond memories of pets or farm animals. Growing up with a furry, affectionate friend is a satisfying part of most childhoods. Many of our abilities to form healthy, adult relationships may stem from our first joyful experiences with pets. Household animals may be treasured pals with whom children can share secret thoughts, private moments and companionship during lonely or stressful times. Pets may help teach children the responsibilities of daily living, compassion for other creatures who share our planet, and the cycles of life and death. They may help build self-esteem and self-confidence. Medical practitioners, psychologists, social workers, reading specialists, occupational and physical therapists, health care professionals and others in many different fields are tapping into this unique human-animal bond for its potential therapeutic value. 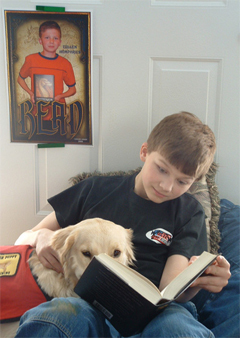 Animal-Assisted Activities (AAA) provide opportunities for motivational, educational, therapeutic and/or recreational benefits to enhance quality of life. AAA are delivered in a variety of environments by a specially trained professional, paraprofessional, and/or volunteer in association with animals that meet specific criteria. These are generally the basic short meet-and-greet sessions of pets visiting people in a hospital, long-term care center, etc. The same activity can be repeated with many people. Specific treatment goals are not planned for each visit, detailed notes and documentation are not required, and visits are spontaneous and can be as short or long as necessary. 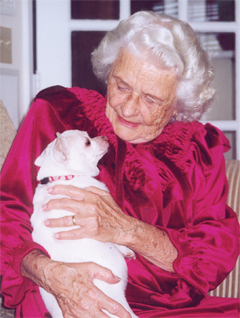 Animal-Assisted Therapy (AAT) is more structured, a goal-directed intervention in which an animal is incorporated as an integral part of the treatment process. AAT is delivered and/or directed by a professional health or human service provider who demonstrates skill and expertise regarding the clinical applications of human-animal interactions. AAT is documented and evaluated within an individualized treatment plan. Sessions generally have a fixed length. Most interventions are AAA. They start with someone who has a pet that they think would be suitable. AAT, on the other hand, usually starts from the patient’s perspective, identifying the patient’s needs and finding a suitable animal. There are several ways to get started in AAT/AAA. Click here for some ideas to get you and your pets off on the right paw!